Combine flour, salt, and pepper in 1 gallon ziploc. Cut beef into 1/2 inch to 1 inch cubes. Dump beef cubes into flour mixture and shake to coat. Melt butter in dutch oven or skillet over 350 degree coals for Frying. Brown beef in butter, turning often. Add onion and garlic, sauteing until golden, about 5 minutes. Add water, broth, and mushrooms. Reduce heat to 225 degrees and simmer about 25 minutes, stirring occasionally. While cooking, prepare a pot of rice, noodles, or mashed potatoes. Stir sour cream into beef and heat for about 3 minutes, but do not boil. Serve beef stroganoff on noodles, rice, or potatoes with chives or dill sprinkled on top. Let me know how you enjoyed your Stroganoff! We made this for dinner tonight over mashed potatoes and we absolutely loved it! We tend to like our sauce a little thicker so in the future we will use a bit more flour and skip the water, but that is just personal preference. Great flavor. Thank you for sharing this recipe. 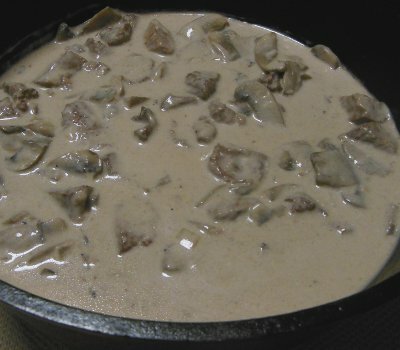 This is by far the best stroganoff recipe we have ever made. I made this recipe, but since we have little kids we substituted ground beef for the steak. Wow! Really really good! I used my ‘ole Webber kettle grill for the Dutch oven cooking in the cold Michigan night. A winter comfort classic.